Dog paws have intricate circulation systems designed for warmth, making them similar to penguins and dolphins. 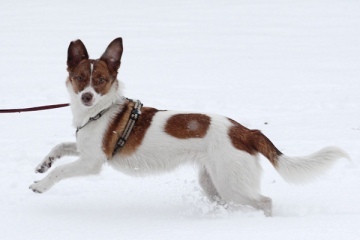 All that snow and ice just doesn’t seem to bother little Fido’s paws, and new research actually explains why. Dogs’ paws, which lack the warm coverings on the rest of their bodies, have an intricate heat transfer system built in that immediately warms cold blood. Couple that system with a high amount of freeze-resistant connective tissue and fat located in the pads of the paw, and a dog’s paw rivals that of a penguin’s wing for the ability to stay warm in crazy-cold climates. Researchers in Japan recently studied the legs and paws of dogs and discovered that a “wonderful network” of veins helped quickly circulate blood from the pad through the legs to warm it back up before sending it into the body, keeping the overall temperature of the dog steady. This same network has been found in penguins’ extremities, arctic foxes and even dolphins’ fins. Released in the journal Veterinary Dermatology, the researchers found that with arteries running right close to veins, warm blood actually passed by the cool blood, helping to speed warming even more. This system, dubbed “counter-current heat exchanger” also pulls warm blood to the paws and limits the amount of blood near the body’s cool skin. Earlier research had claimed that dogs have tissue in their feet that keep them from freezing all the way down to -35 degrees Celsius, meaning you can let your pet dog play freely with your pet penguin without fear of frozen paws. Did you know cheetahs ride shotgun?